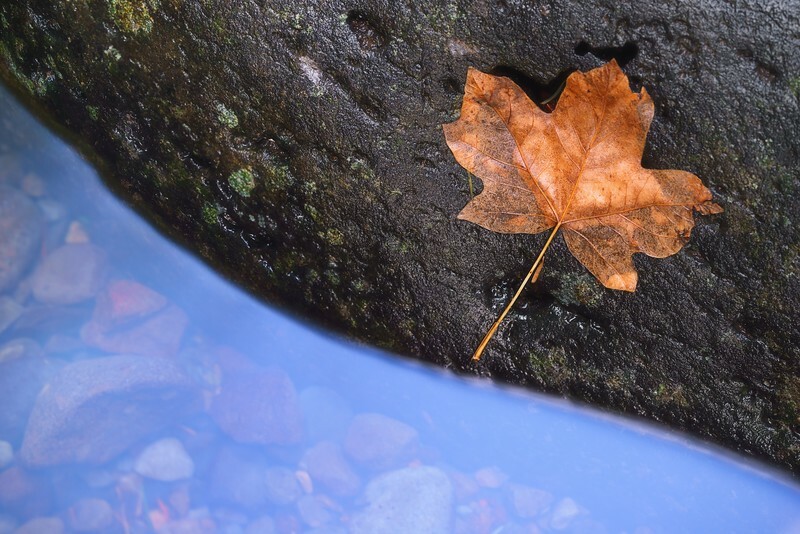 A bigleaf maple leaf that didn't quite live up to its name clings to a boulder lying within the stream bed just beyond Ponytail Falls, while blue sky is reflected in the placid waters gently flowing past. It perhaps would seem strange to think that on a day spent shooting beautiful Spirit Falls, Panther Creek Falls, and Ponytail Falls with talented and genuinely good-natured photographers Paul Dekort and Justin Poe that this would wind up being my favorite image of the day, if not the entire weekend. I think the simplicity of the scene as well as the serendipitous manner in which I happened upon it spoke to me in a way that the waterfalls--as grand and awe-inspiring as they were--just couldn't on this day. Perhaps, too, it mirrors the return to simplicity within my own life that I find myself pining for all too often lately.